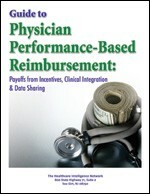 The Guide to Physician Performance-Based Reimbursement: Payoffs from Incentives, Data Sharing and Clinical Integration explores newly minted reimbursement formulas at two health plans and two independent practice associations (IPAs), providing payor and provider perspectives on the formula development process; clinical, quality and efficiency measures in use; physician incentive payments and program outcomes. This 60-page special report also examines the collection and sharing of physician performance data by these four organizations and the impact of data sharing on physician engagement, health outcomes, utilization and cost. Reserve your print copy or Adobe Acrobat PDF today.